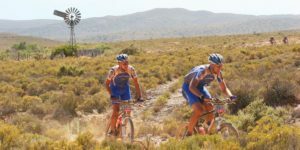 Eight years after our first epic in 2005 we were back, here is the Cape Epic 2012 race review as Team OFM. 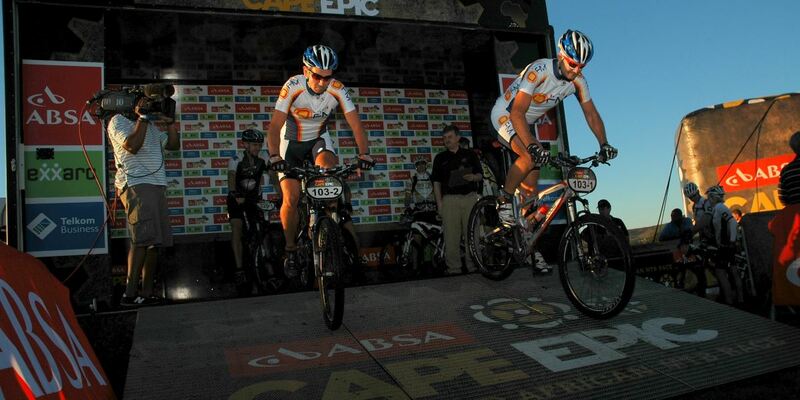 Absa Cape Epic 2012 was a race of extremes, we experienced extreme heat, gale force winds, freezing cold and rain. 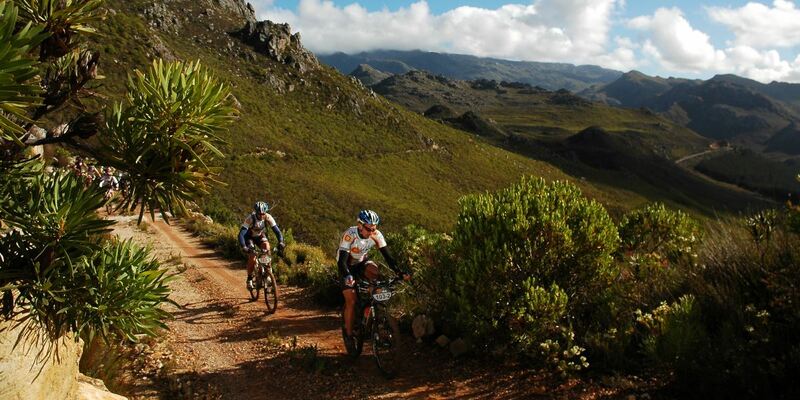 All of that mixed in with the usual Epic distances, climbs, descents and unrelenting terrain. This race was about a battle against the route and the weather. With long days in the saddle and extreme conditions it was the ultimate test of endurance and will power. 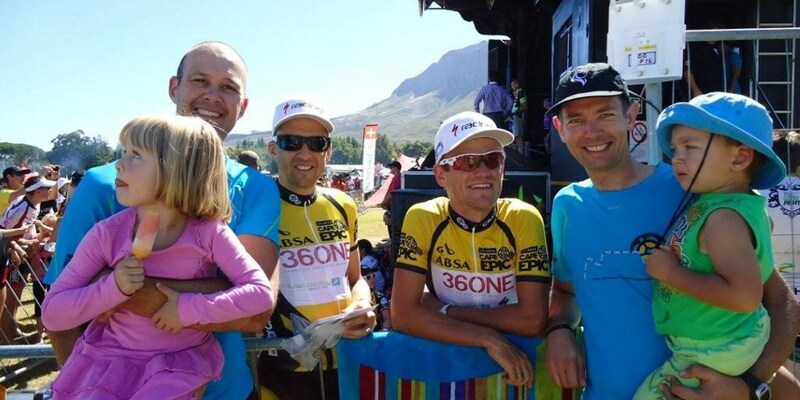 It was a tough way to clinch our 5th epic finish and crossing that finish line in Lourensford was sweeter than ever. Here is our traditional pic with winners Christoph Sauser and Burry Stander. Read about our 4 previous epics in The Epic Guide. The prologue was a great way to start 2012 because it allowed us to to have a good warm-up and to check that everything was working properly on the bikes. We were lucky to get an early start at 7:22 so we avoided the heat of the day. We rode as hard as we could but with 900m of climbing in 27km it was hard but really enjoyable because the trails were awesome to ride. We rode well and stayed in one piece finishing in the 20s in the masters category. Stage 1 was the start do the epic proper and we were really nervous before the start not knowing how we were going to feel. Little did we know that we would feel ok but the route was going to be brutal. It started off with some nice rolling hills but soon we hit the first of two climbs that we’re so steep loose and rocky that they were not rideable, and so we started the first of 3 long portages. It was cool to start off but as the sun came out the temperatures rose and the walking up the climbs had sweat sheets of water running off our faces. The first 60km took forever but after this the bulk of the climbing was done but the walking had taken its toll. The last 30km after the 80km water point were faster but hard as fatigue was setting in and we started to fade. Some tricky climbs at the end made this a hard day out. We maintained our position in the field but realized that we could not sustain this pace for the rest of the 6 stages. Stage 2 was the easiest stage on paper for epic 2012 but it was still a long day out with over 119km to be covered. We decided to take it easy and ride at a comfortable pace irrespective of how the rest of the field was doing. Some of the highlights were passing through McGregor and it looked like the whole town was out to support the riders and then also passing through Van Louveren wine estate It turned out to be a relatively easy day in terms of climbing but the tracks were still rough so the going was slow and we had a long day out. However we finished comfortably and felt good but had lost several positions. Stage 3 was the biggest day with an expected 143km of tough riding with a huge amount of climbing. The start was fast with the only really long section of tar followed by district road. We took it easy again this day and rode well within ourselves. The first two climbs around Villiersdorp brought back some memories from previous years. A great memory was seeing some painted names on the road entering Villiersdop that were put there by our loving wives on one of our previous epics. It was a really long day out with 4 water points and the biggest climb of the day coming at 110km. This last climb was long but we had a bit of a tail wind on some parts which helped. We lost many positions as teams streamed passed us but we stuck to our plan despite the frustration of having to hold back. There was a final sting in the tail with a climb leading into the decent before Caledon. With 5km to go we had a little magic as we just wanted to get to the finish and made a dash for it with a good strong finish. With our two “easy” days behind us we started Stage 4 down in C group which suited us better as this was the speed that we had been riding at for the previous 2 days. Stage 4 looked hard on paper and it turned out to be even harder. This was was where our take it easy strategy was going to pay off. There was a huge amount of climbing with a fair amount of portaging again as we went up to Charlie’s heaven a spectacular hard and long climb that resembled a lunar landscape after fire had wiped out everything. Today we unleashed the Morewood Zulas on the down hills as we would consistently make up several places on the long technical descents. It was awesome riding that made up for the walking on the steep loose climbs. We were expecting a 5-6h day out but as we approached the last water point after 5h of riding with 20km to go it was clear that we were in for another long day. We had 20km to go into a gale force headwind with some steep single track climbs waiting for us at the end. It was a slog but we grouped up with other riders and covered the bulk of the distance in a group to conserve energy in the gale force wind. When we got to the last 5km of single track we pushed ahead to get some clear track and have some fun. We ended with a strong finish back into Caledon after another really hard day out. It was becoming clear that Epic 2012 was going to be the toughest ever as the days were getting harder and harder with no chance for rest. As the rain fell that that night and warnings for heavy rain were issued for the Western Cape it was hard to imagine what lay in store for us on Stage 5. As we set off on Stage 5 the rain came down and did not let up for the whole day. We spent all day and 120km in the mud wet and cold. It was an impossibly hard day that was slightly more familiar to the European riders and was the worst nightmare for the weather phobic South Africans. After just 10km our bikes and drive trains were jammed with mud, glasses muddied over and we were soaked to the bone. It took incredible mental reliance and grit from all the riders to look past the terrible conditions and focus on the job of pedalling our bikes. We made a concerted effort and commitment to each other to put our heads down and get through to the end. The climb up through Kogelberg reserve was the hardest part as the rain stung our faces and the freezing temperatures made the our fingers numb and we shivered, dreading downhill’s and wishing for up hills to generate some heat. The cold froze our sore and tired muscles inducing cold cramps and pains. It was difficult to imagine finishing at this point as the challenges seemed never ending and the sky was dark and gloomy all around us. Water points were frantic stops to refuel and replace worn brake pads and keep the drivetrains running. Thanks goodness for our Shimano 2×10 which didn’t skip a gear change through the worst conditions. Eventually we made it to Oakvalley, the single track turned into mud porridge a far cry from the ecstasy inducing sweet single track we were looking forward to. By that stage we had seen the worst so we just pushed through knowing that the end to this day was waiting for us. In one day i got more mud riding experience than i would normally get in several years of riding. We didn’t care where we finished crossing that line, all we cared about was that the suffering was over and that the hardest day ever had ended. Stage 6 started out a bit chilly but in full sunshine and blue skies but shoes still muddy and wet from the day before, a reminder of the suffering? This was not going to be an easy day either as there was over 2000 m of climbing in just 85km and most of it would be spent on the infamous Groenlandberg. All in all it was a good day out for us but the climbing was long and slow going with both of us feeling the efforts from the long day before. The first climb up through Grabouw was steep and loose in places. The Groenlandberg climb was up the longer more gradual side so it was quite comfortable but was long but the reward the the decent of the other side and that was worth it. As usual we made up many places and really enjoyed the decent. The next section was rolling contour road over some technical rocky sections where we could maintain a comfortable pace. Eventually we were climbing again up the side of Groenlandberg but it was a short section. Then we were onto downhill’s again and it was good times as we rolled into the last water point. The last 20km were mostly single track and really fun although there were still a few steep climbs to get up to the top of the Oakvalley single track. After then it was a speedy ride into the finish and the end of probably the best days riding at this years epic and our shorted day out at around 5:35 for the day. 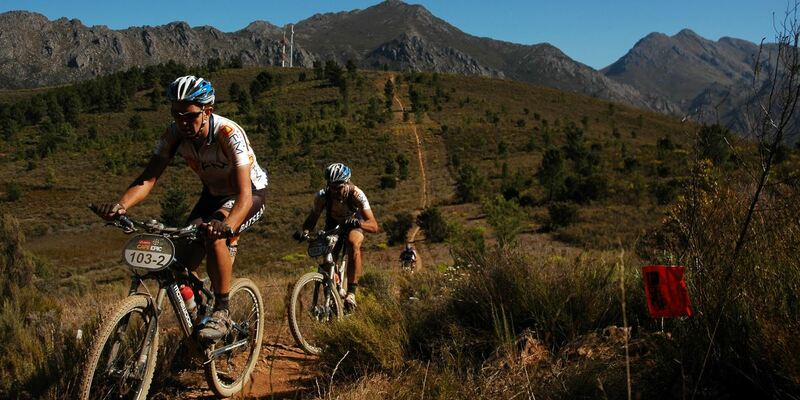 With a great second last days ride behind us now we were all looking forward to Stage 7 the final run into Lourensford. it had been a long week with some of the hardest days imagine able in a row. We were back in B group for the last day which meant that we could get a good fast start. We knew we were in for a good day when AC/DC Highway to Hell blasted over the start line. We felt good and went full speed from the start straight into the first climb of the day. We spent a good few km riding with Lloyd and Mike from Bigringracing and at time it felt like being out for a great days riding with your best mates. The first 30km was almost all climbing with the portage section over the old Waapad and then some great new single track along the railway line and then through the forest. After the water point the was still more climbing through the vineyards with some steep climbs, but we pushed on and maintained a good pace. The 3 greatest moments of the race were about to happen, first seeing the final 5km sign to Lourensford and the then the 1 km sign and finally the run onto the finish straight. It is only in these final moments that you actually realize and accept that you are going to finish this race. Crossing that finish line for the fifth time and after such a great day on the bike was a great way to end off such a hard week of riding.